Dubai: The number of UAE residents visiting Azerbaijan has doubled over the past two months and is expected to increase further since the visa-on-arrival policy for two countries began in July, a diplomat said. Azerbaijan appears to have been added to the places-to-visit list of UAE residents since visa rules have been relaxed. “The visa-upon-arrival policy started this summer on July 26. Since implementing the policy, the flow of tourists from the UAE to Azerbaijan has increased two-fold,” Javidan Huseynov, Consul General of Azerbaijan to the UAE, told Gulf News, without revealing the exact figures. “Now, UAE residents can easily organise trips to Azerbaijan and can obtain the tourist visa to our country at the airport in Baku as well as at the other airports of Azerbaijan,” he said. Currently, direct flights to Baku from Abu Dhabi, Dubai and Sharjah have reached 30 per week, thereby increasing contacts between business communities and people of the two countries, Huseynov said. An estimated 7,000 Azerbaijani expatriates are living in the UAE, mostly in Dubai. Some 10 per cent of them are engaged in the public sector, particularly in the energy sector, while the rest are working in different sectors such as tourism, education, hospitality and media or are running their own businesses. Azerbaijan exports foodstuff, fruits and vegetables, nuts, car parts and combustion engines to the UAE and imports electrical appliances, vehicles and spare parts, chemicals, lubricants, construction materials and accessories and pipes from the UAE. A trade office will be inaugurated in Dubai by the end of the year to further facilitate trade between the two countries. “A trade representative has already been appointed and the office is already operating. 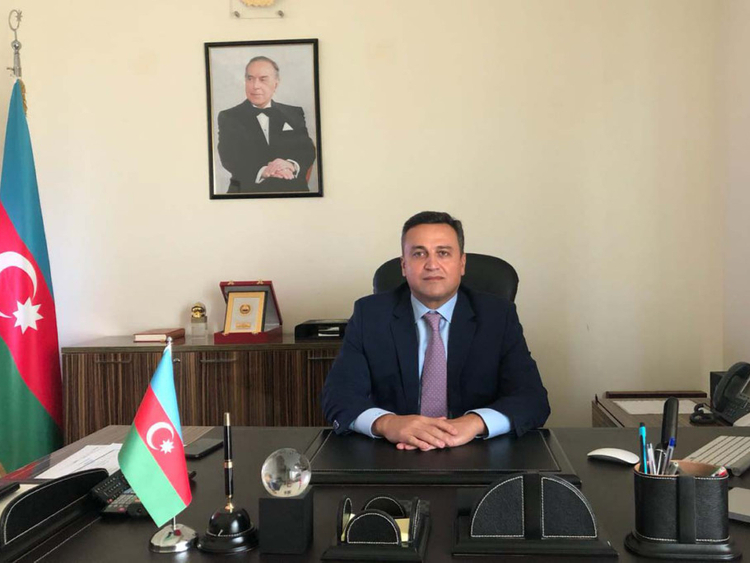 This new step is aimed at the promotion of Azerbaijan products and goods in the UAE, and, of course, the main goal is to expand bilateral trade between the two countries,” Huseynov said. The trade turnover with Azerbaijan in 2017 was approximately $221 million (Dh811 million), Huseynov said, quoting figures from the Dubai Chamber of Commerce and Industry. He is positive this number will further increase this year due to the “warm, close and cordial relations” between the two countries. And just as 2018 is the celebration of the Year of Zayed, the 100th year since the birth of the UAE’s Founding Father, Shaikh Zayed Bin Sultan Al Nahyan, the year is also special to Azerbaijan as it commemorates the 100th founding anniversary of the country as a democratic republic. “The establishment of the Azerbaijan Democratic Republic in 1918 is a historic and remarkable event for our people. It was the first democratic republic with a parliamentary form of government in the East and in the Muslim world. Although the Azerbaijan Democratic Republic existed for 23 months, it managed to do a lot during that time. Many democratic reforms were made,” Huseynov said. Among these reforms were the right to suffrage granted to the entire population regardless of their race, gender, ethnicity and religion. The Eurasian country became the first Muslim nation to give women equal political rights with men. It was also in that period when Baku State University was founded and the Azerbaijan language was adopted in all educational institutions. Azerbaijan was led to independence for the second time in 1991 by the national leader, Heydar Aliyev. This led to a path of development under the leadership of his son, the current president, Ilham Aliyev.